"We do not intend to leave Iraq until it is self-sufficient and secure. The timeframe depends largely on the Iraqis, themselves. The government of Iraq has outlined a path towards self-sufficiency and we are doing everything we can to help them meet their goals." "[.....] is an initiative of the Government of Iraq which has support from the international community. It seeks to encourage cooperation with international bodies [60 to date to be exact] to encourage the economic, political and social development of the region. The website provides information on the aims of the programme and its activities. It includes press releases, declarations and an online library of associated speeches, full text documents and reports. These provide insight into the progress of the reconstruction of Iraq in the post Gulf war period." The original document in question detailing the ICI is 60 pages long. It usually resides at its own web site, but as of this evening that account for some reason has been suspended. I find this extremely curious. This morning I was actually in the site perusing it for about 15 minutes before I had to leave. What was striking about the parts I was able to read was it's stunning lack of detail about just what the international community was committing to. Today's press conference in Sharm el-Sheikh was played back this evening on C-Span. From what I could watch not only was the Iraqi Parliament recess not asked about from any of the journalists present, the redoubtable Ms. Rice never even brought it up. When asked about a timetable for the ICI, it's implementation or benchmarks measuring effectiveness Rice gave the same old bromide, recycled with a couple of new words, for the pass four years when asked about U.S. military presence on the ground, [paraphrasing here] "You can't let artificial timetables impede the progress currently being made in Iraq today. We have to let the Iraqi's complete the process [emphasis mine] for stability. The process takes time." The UN sponsored ICI, which began to come together last July, was launched with a press conference back on April 20th. According to the UN the ICI was described as a process of a larger initiative: '[.....] "aid for trade,” a strategy to enable developing countries to take a greater role in the international trade system.' 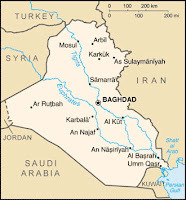 The ICI was also described as an international effort to aid Iraq through a compact: "The Compact is a five-year national plan that includes benchmarks and mutual commitments from both Iraq and the international community, all with the aim of helping Iraq on the path towards peace, sound governance and economic reconstruction. " The only thing "new" about this initiative is that it is supposed to have been introduced by the Iraqi's themselves. It's curious that on the eve of this all important conference in Sharm el-Sheikh, Egypt so critical to Iraq's future their Parliament's answer to this international commitment is a two month recess. So much for benchmarks. You have to give the Bush WH this much, the high camp factor for what passes for foreign policy seems to be achieving new heights on a daily basis. The imagery and visualizations offered to the global diplomatic community with each Bush press conference and Rice appearance on the international stage only serves to underline the surreal quality they project. This is especially so after Iraqi Foreign Minister Hoshyar Zebari, a Kurd, gave a blunt assessment to the same group of journalists that questioned Ms. Rice later that day by asserting that Iraq's problems stem from the fact they are an occupied country with a foreign army that is a continuous cause for the escalating sectarian strife. Ms. Rice blew off the question from the press when asked about it and continued to repeat the same thing over and over in the press conference: the US is there by invitation only. Soon after that the press conference degenerated into a discussion about non U.S. - Iranian relations. 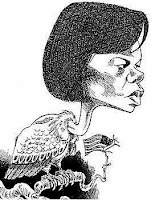 Only after Ms. Rice was drawn off the subject of Iraq did she seem animated and engaged. Otherwise she looked bored and flippant when discussing Iraq's problems. 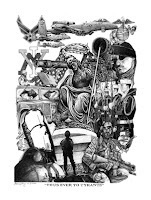 As the latest Bushian set of reasons for continued American military presence evolves via the newest phrase du jour to date evoking the rejection of "artificial timetables" it is becoming more and more apparent each day there is no foreign policy - only a holding pattern of sorts. The UN commitment at this point is problematic at best because of the lack of security on the ground throughout Iraq. At this point implementation of the ICI is impractical. The risk factor for the other countries involved in this so called compact is negligible since the U.S. military is the one taking all the risks and responsibility for security. As the Iraqi Foreign Minister has already demonstrated with his bluntness regarding his feelings about American military presence the U.S. government finds itself in a catch 22 position regarding Iraqi sovereignty. Forcing their hand would only undermine the latest justification of our presence. Iraq's neighbors get to look properly concerned and engaged while the UN gets to look relevant. Meanwhile U.S. troops get caught in the middle while nothing happens and Bush waits our his term so he can claim he never "surrendered." This artificial foreign policy seems to serve only one purpose - preserving some notion that Bush has regarding his legacy. Unfortunately for the grunts on the ground it comes at the highest price imaginable - their lives. Only Americans understand Iraq, right? Oh yes, indeed. Current events in Iraq serve only to underline our complete understanding of what’s happening on the ground, doesn’t it? And telling the Sunni’s in Saudi Arabia and Iraq’s other neighbors that us Americans have a better understanding of Sunni’s in Iraq than they do really reinforce our credibility in the region, doesn’t it? This is a major difference between Edwards and the rest of the field. He refused to adopt the GOP/Bush framing on this issue and redefines it with reality and exposes the crassness and realpolitik of its usage. There is no doubt Edwards has thought this out and continues to try evolve his stump speech to reflect this all important step to reject the GOP meme on this disasterous war. In the SC debate last week Sen. Edwards stood out amoung the others as he alone refused to adopt the GOP frame on this issue when he refused to raise his hand when the group was asked if they supported the GWOT. Like Matt Stoller over at Mydd, I have high hopes regarding Edwards' movement on this issue. It will be highly interesting to see where his campaign will be on this in the fall. What's striking about this is Hillary's position adopting the GOP frame and the policy of leaving behind a significant fighting force in Iraq indefinitely. Let's repeat that, shall we? "....all the terrorist would have to do is wait for the date we pull out and then plot to take over the Iraqi governemt." My question to this Bozo would have been this follow up? "You mean after we invaded, occupied and imposed our institutional model and values on them first? Am I the only one to see the irony of this? John Barrow D-Georgia 12th Dist. Dan Boren D-Oklahoma 2nd Dist. Lincoln Davis D-Tennessee 4th Dist. Michael McNulty D-New York 21st Dist. Jim Marshall D-Georgia 8th Dist. Gene Taylor D-Mississippi 4th Dist. And then there is Dennis Kucinich D-Ohio 10th Dist. He voted “Present” instead of a ‘yea’ or ‘nay’ vote. His “explanation” is on his web site. What a kook. Walter B. Jones R-North Carolina 3rd Dist. Wayne Gilchrest R-Maryland 1st Dist. I will send a short little missive to our red state Democrats reminding them they should have voted to override on this issue. Look at Rep Walter B. Jones in N.C. Last time I checked, North Carolina was a red state. Good for him.